After the durian poisoning incident which affected hundreds of students a case of food poisoning surfaced in Aleosan, North Cotabato. 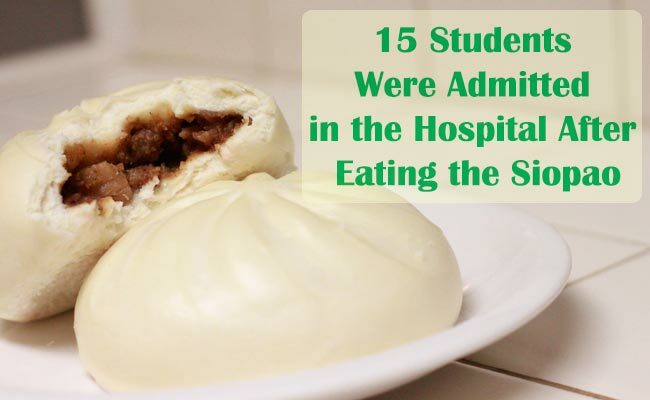 Around 15 students were admitted in the hospital after eating the siopao they had bought from their school cafeteria. The nine victims are admitted at Aleosan District Hospital and the six others were already given the clearance to go home according to police spokesman Superintendent Bernard Tayong of North Cotabato provincial police. According to the Inquirer, all of the victims are students of Dualing Central Elementary School. They had experienced vomiting and abdominal pain only a few minutes after eating siopao during the recess on July 9. The students are Grade 5 pupils with ages 9 to 11. The physician who looked after the children, Dr. Nessel Lontiong Mondoñedo, had officially declared that the victims suffered acute gastritis due to ingesting siopao. According to the school principal Joel Calambro, the siopao was delivered by Jane Miranda. She delivered 100 pieces of siopao that day and 67 were sold in the canteen. Miranda had been delivering siopao to the said school for years and it is the first time such an incident had happened. The investigators believed that some of the delivered siopao were not newly cooked, which led the student to having abdominal pain and vomiting. The local police department had recommended to the parents and guardians to file charges in accordance to Republic Act 7394, or the Consumer Act.